The Spider Web Discussion is a simple technique that puts this kind of class within every teacher's reach. The name comes from the web-like diagram the observer makes to record interactions as students actively participate in the discussion, lead and support one another's learning, and build community. It's proven to work across all subject areas and with all ages, and you only need a little know-how, a rubric, and paper and pencil to get started. As students practice Spider Web Discussion, they become stronger communicators, more empathetic teammates, better problem solvers, and more independent learners—college and career ready skills that serve them well in the classroom and beyond. 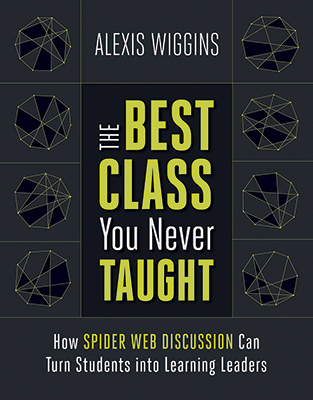 Educator Alexis Wiggins provides a step-by-step guide for the implementation of Spider Web Discussion, covering everything from introducing the technique to creating rubrics for discussion self-assessment to the nuts and bolts of charting the conversations and using the data collected for formative assessment. She also shares troubleshooting tips, ideas for assessment and group grading, and the experiences of real teachers and students who use the technique to develop and share content knowledge in a way that's both revolutionary and truly inspiring. Alexis Wiggins is the founder and director of the Cohort of Educators for Essential Learning, an organization that unites like-minded educators around the globe.